With final-status talks between Israel and the Palestinians underway, Jerusalem is finally in play. At base, the argument here consists of an argument between Jews and Moslems over who has the older, better documented, and deeper ties to the Holy City. A cursory review of the facts shows that there is not much of a contest. Jerusalem has a unique importance to Jews. It has a unique place in Jewish law and a pervasive presence in the Jewish religion. Jews pray toward Jerusalem, mourn the destruction of their Temple there, and wishfully repeat the phrase "Next year in Jerusalem." It is the only capital of the Jewish state, ancient or modern. In contrast, Jerusalem has a distinctly secondary place for Moslems. It is not once mentioned in the Koran or in the liturgy. The Prophet Mohammed never went to the city, nor did he have ties to it. Jerusalem never has served as the capital of any polity, and has never been an Islamic cultural center. Rather, Mecca is the "Jerusalem" of Islam. That is where Moslems believe that Abraham nearly sacrificed Ishmael; where Mohammed lived most of his life; and where the key events of Islam took place. Moslems pray in its direction five times each day and it is where non-Moslems are forbidden to set foot. Jerusalem being of minor importance to Islam, why do Moslems nowadays insist that the city is more important to them than to Jews? The answer has to do with politics. Moslems take religious interest in Jerusalem when it serves practical interests. When those concerns lapse, so does the standing of Jerusalem. This pattern has recurred at least five times over 14 centuries. The Prophet. When Mohammed sought to convert the Jews in the 620s C.E., he adopted several Jewish-style practices - a Yom Kippur-like fast, a synagogue-like place of worship, kosher-style food restrictions - and also tachanun-like prayers while facing Jerusalem. But when most Jews rejected Mohammed's overtures, the Koran changed the prayer direction to Mecca and Jerusalem lost importance for Moslems. The Umayyad Dynasty. Jerusalem regained stature a few decades later when rulers of the Umayyad dynasty sought ways to enhance the importance of their territories. One way was by building two monumental religious structures in Jerusalem, the Dome of the Rock in 691 and Al-Aqsa Mosque in 715. Then the Umayyads did something tricky: The Koran states that God took Mohammed "by night from the sacred mosque in Mecca to the furthest (al-aqsa) place of worship." When this passage was revealed (about 621), "furthest place of worship" was a turn of phrase, not a specific place. Decades later, the Umayyads built a mosque in Jerusalem and called it Al-Aqsa. Moslems since then understand the passage about the "furthest place of worship" as referring to Jerusalem. But when the Umayyads fell in 750, Jerusalem lapsed into near obscurity. The Crusades. The Crusader conquest of Jerusalem in 1099 evinced little Moslem reaction at first. Then, as a Moslem counter-crusade developed, so did a whole literature extolling the virtues of Jerusalem. As a result, at about this time Jerusalem came to be seen as Islam's third most holy city. Then, safely back in Moslem hands in 1187, the city lapsed into its usual obscurity. The population declined, even the defensive walls fell. The British conquest. Only when British troops reached Jerusalem in 1917, did Moslems reawaken to the city's importance. Palestinian leaders made Jerusalem a centerpiece of their campaign against Zionism. When the Jordanians won the old city in 1948, Moslems predictably lost interest again in Jerusalem. It reverted to a provincial backwater, deliberately degraded by the Jordanians in favor of Amman, their capital. Taking out a bank loan, subscribing to telephone service, or registering a postal package required a trip to Amman. Jordanian radio transmitted the Friday sermon not from Al-Aqsa but from a minor mosque in Amman. Jerusalem also fell off the Arab diplomatic map: the PLO covenant of 1964 did not mention it. No Arab leader (other than King Hussein, and he rarely) visited there. The Israeli conquest. When Israel captured the city in June 1967, Moslem interest in Jerusalem again surged. The 1968 PLO covenant mentioned Jerusalem by name. Revolutionary Iran created a Jerusalem Day and placed the city on bank notes. Money flooded into the city to build it up. Thus have politics, more than religious sentiments, driven Moslem interest in Jerusalem through history. 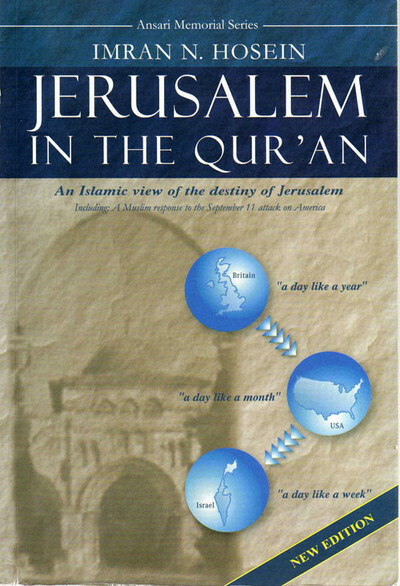 'Jerusalem in the Qur'an' was written partly in response to the newspaper article of Daniel Pipes that was published in the Los Angeles Times ("Jerusalem means more to Jews than to Muslims", July 21, 2000). In it he attempted to dismiss any Islamic claim to Jerusalem by declaring of Jerusalem, among other things, that: "It is not once mentioned in the Qur'an or in the liturgy…" Dr. Pipes and his media surrogates, who provoked us to respond, may wish to revise their opinion if they were ever to read this book..
After having looked at Hosein's book, my views remain quite unchanged. Related Topics: Arab-Israel conflict & diplomacy, Jerusalem | Daniel Pipes receive the latest by email: subscribe to the free mef mailing list This text may be reposted or forwarded so long as it is presented as an integral whole with complete and accurate information provided about its author, date, place of publication, and original URL.